U.S. Attorney General Loretta Lynch addresses a group of Pittsburgh high school students and graduates in a discussion on community-police relationships, particularly with the city's youth. U.S. Attorney General Loretta Lynch visited Pittsburgh on Monday as part of the nationwide Community Policing Tour that highlights cities taking innovative and effective steps to build trust between the police force and the community. Pittsburgh is one of six pilot cities in the National Initiative for Building Community Trust and Justice announced by former U.S. Attorney General Eric Holder in March. The program aims to increase contact between the attorney general’s office and local community and police leaders. As part of the initiative, Pittsburgh will receive more than $1 million to fund implicit bias training for officers. The grant will also contribute to gathering statistics on community-police interactions to get a better sense of how these interactions are carried out and to gauge community perspective on existing community-police relationships. Lynch said this program is meant to supplement the efforts Pittsburgh has already taken to build trust between the police and the community, such as the “Safer Together” initiative announced in February. “We really hope to be part of the force that continues what’s begun here in Pittsburgh, which is a dialogue between the police and community, and we hope to strengthen that dialogue,” said Lynch. Lynch said Pittsburgh, like the other cities on the tour, has had historically rocky relationships between the police and the communities, most notably and recently with the arrest of former Pittsburgh Police Chief Nate Harper in 2014. Lynch said though each city has tumultuous community-police relationships for different reasons, they’ve found increased community engagement is an effective solution. “When we talk to communities that feel that they do have that positive and respectful relationship, the main thing they say is that before there’s a problem, the police are in the community getting to know us and getting to know what our concerns are,” she said. Because the tour is part of President Obama’s “My Brother’s Keeper” initiative, Lynch, along with Pittsburgh Police Chief Cameron McLay and US Attorney David J. Hickton, met with 12 high school students or recent high school graduates for a discussion about their perceptions of community-police relations in Pittsburgh. Lynch emphasized the importance of building relationships between law enforcement and children and said she’s “optimistic” about the initiatives students have started in their high schools, as well as the police department’s priority of connecting with Pittsburgh’s youth. Savannah Mynahan, a junior at Brashear High School, participated in the discussion with Lynch. She helped start a program at her school that will bring students and police officers together in a training program and a roundtable discussion, with the goal of building honest relationships between the two that they found, in a survey, hasn’t really existed before. “It’s something that I’m passionate about, and I just want the relationship there, that way we won’t have to experience another case like Michael Brown or Leon Ford or Tamir Rice,” she said. Lynch said she’s also proud of the work US Attorney Hickton has done locally, establishing a civil rights division in his district office that focuses on law enforcement accountability and his participation in roundtable discussions. During the visit, Lynch spoke at the Fraternal Order of Police’s 62nd National Biennial Conference, and she was part of a community policing roundtable at the Hill House Association, with attendees such as Hickton, Chief McLay, Mayor Bill Peduto, and other community leaders. 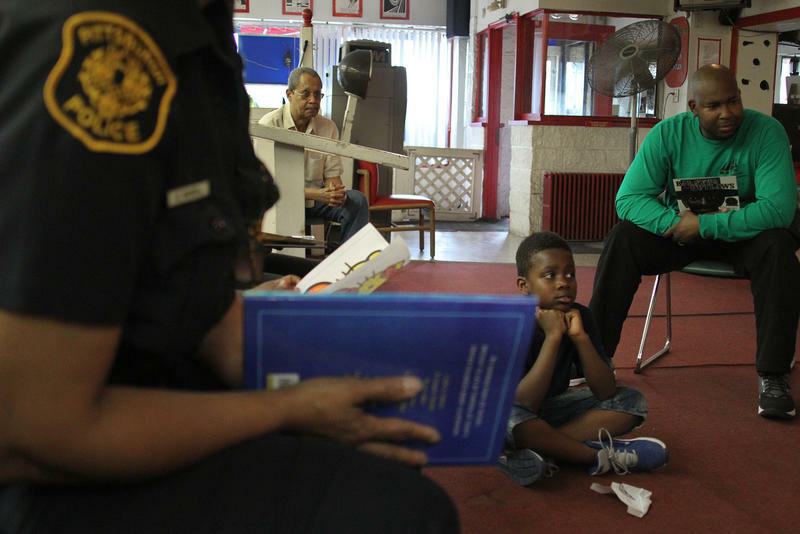 Before she brought the students into the main area of Willy Tee’s Barbershop in Homewood to listen to a story, Cynthia Battle asked parents and police officers what their favorite childhood book was. Battle, a community outreach specialist for the Pittsburgh Association for the Education of Young Children (PAEYC), said she loved "The Pancake Man." On Thursday, Attorney General Eric Holder announced that Pittsburgh is one of six cities designated as a pilot site for a national initiative to strengthen and improve the relationship between law enforcement and the community. It's called the National Initiative for Building Community, and it’s a partnership between the Department of Justice and legal experts from institutions such as the John Jay College of Criminal Justice and Yale Law School. The Pennsylvania Senate Judiciary Committee held a public hearing in Pittsburgh Wednesday, where city and county officials called for amendments to state laws that limit the use of body-worn cameras by police officers. According to Cole McDonough, chief of the Mt. Lebanon Police Dept., the state Wiretap Act requires officers to turn-off or remove their body cameras before entering a private residence without a warrant. McDonough said this creates safety and liability issues. 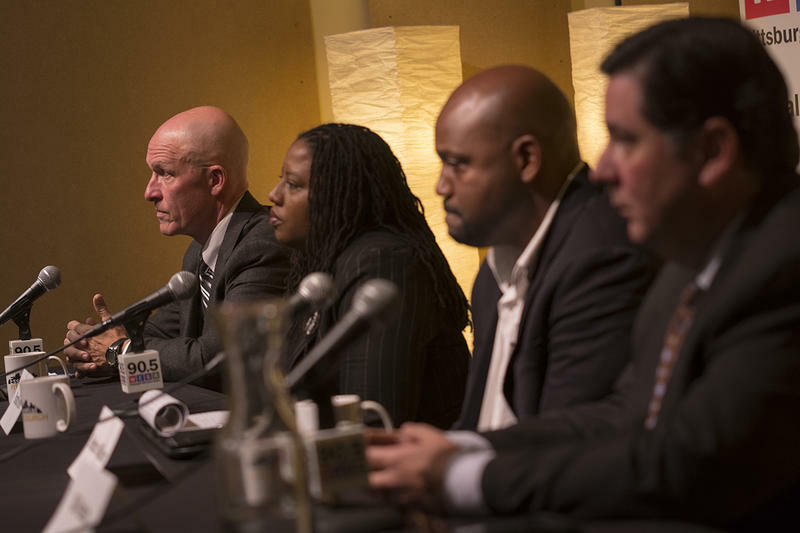 Pittsburgh’s acting police chief and Mayor Bill Peduto were two panelists in a discussion on police/community relations as part of the Mayor’s Night on Air at the Community Broadcast Center Wednesday evening. Tensions have been high between police and the black community in Pittsburgh due to issues that have been building up for decades. Now, Peduto said work is underway to change that. “We have done more than just hiring a police chief; we have created a culture change within Pittsburgh,” Peduto said. Peduto cited his hiring of Public Safety Director Stephen Bucar and bringing in a new chief from outside the ranks of the Pittsburgh Bureau of Police. He also said through years of politics in the department, control over the organization and morale has taken a hit. Acting Police Chief Cameron McLay said he has been welcomed by rank-and-file officers, but he knows change won’t occur overnight. To start to tackle the issue, Peduto said three critical areas within policing need to be reformed. The first is how officers are recruited.